Pretty Dark Nothing started off with a bang and the drama just kept coming. By the time the big plot reveal happened, my head was spinning. Quinn is being haunted by demons and they are messing up her life. She’s fallen on the high school popularity totem pole, her father ran away and created a new family, her mom is hardly ever around, and her boyfriend left her. She’s feeling lost, alone, and confused. She wasn’t the strongest character, but she wasn’t trying to be. She was trying to get through each day without making it known to the world that she might be going crazy. That takes a different kind of strength. Aaron has always watched from the background, but when his ability brings him to Quinn’s rescue, he’s thrown into her life. They go back and forth for a while, not confident in themselves to make a move. While I’ve read more swoon-worthy boys, Aaron was real. He didn’t always have the perfect thing to say, but he was a real guy. I don’t always need the swoon in order to fall in love with a character and that’s definitely true for Aaron. I didn’t even try to guess what was going to happen in this novel. Quinn’s unpredictability and unreliable narrating made the twists and turns that much more interesting to read. I definitely wasn’t expecting the ending, but once it happened I could see all the clues fit together. The ending was dramatic and has a wonderfully horrible cliff hanger. I am really hoping there is another book to this series because I want to know what happens with Quinn and Aaron. Pretty Dark Nothing drew me in right away and kept me reading long after I should have gone to bed. A book that makes me give up on sleep just to finish it is definitely a book I enjoy. Thank you to Month9Books and NetGalley for an advanced copy of the novel in return for a honest review. 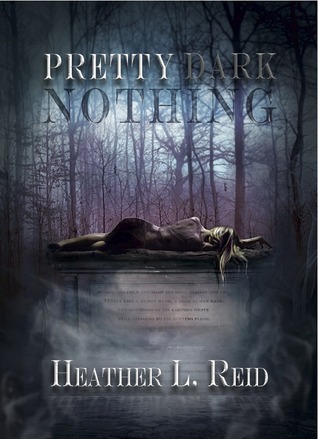 This entry was posted in Something a Little Different, Young (and New) Adult and tagged Fantasy, Heather L. Reid, Paranormal.